Collect your favorite characters from the incredibly popular Disney Tsum Tsum plush toys with this adorable sticker book featuring more than 120 stickers of Tsum Tsum! 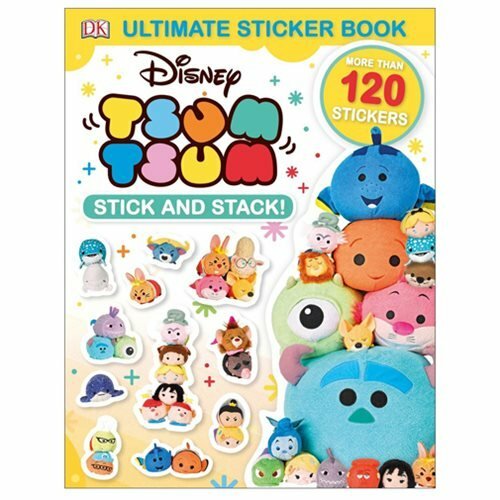 Meet a new wave of irresistible Tsum Tsum plush toys in the 24-page Disney Tsum Tsum Stick-and-Stack Ultimate Sticker Book. This sticker book features the cutest, cuddliest, most-collectible characters from Disney's Tsum Tsum 2016 releases. There are stick-and-stack characters from Finding Dory and Zootopia to Monsters, Inc. and Tangled. The 11-inch tall x 8 1/2-inch wide book is a must for Disney Tsum Tsum fans everywhere!